Above: Prolific Western heroine Peggy Stewart, in a publicity photo for the serial Son of Zorro (Republic, 1947). Peggy Stewart’s demure loveliness and athletic grace made her an admirable Western heroine; she looked the part of the sweet frontier gal to perfection, and was exceptionally convincing when galloping across prairies on horseback or driving a team of horses. She also excelled at making her characters quick-tempered and downright fiery without diminishing their feminine charm. Stewart spent most of her screen career in the B-westerns to which she was so ideally suited, but also found time to appear in four Western serials, to which she proved equally well-suited. Peggy Stewart was born Margaret O’Rourke in Florida and grew up in Georgia. She became an expert rider during her childhood, but her principal ambition was to become an actress. Around 1935, she journeyed to California to attend a family wedding, and then persuaded her mother to let her live in California with her grandmother and attend dramatic school. She was “discovered” by character actor Henry O’Neill, who lived in the same apartment building as Peggy’s grandmother; he recommended the aspiring actress to the casting directors at Paramount Pictures, who were seeking a teenaged girl to play the small but important part of Joel McCrea’s daughter in the 1937 film Wells Fargo. Following her debut in Wells Fargo, Peggy played small roles in films for various studios, principally Universal (the Deanna Durbin vehicle That Certain Age, the urban melodrama Little Tough Guy) and Warner Brothers (the comedy Everybody’s Hobby, Bette Davis’ All This and Heaven Too), while finishing out her school years. In 1940, at the age of 16, she met and married Don Barry, who had just become one of Republic Pictures’ leading B-western stars. Stewart spent a few more years freelancing in bit parts until Barry persuaded Republic to sign her to a three-year exclusive contract, beginning in 1944. Her first film for the studio was the Bill Elliott “Red Ryder” B-western Tucson Raiders; with a few exceptions (like the horror film The Vampire’s Ghost and the mystery The Invisible Informer), she would spend her entire Republic career as a B-western leading lady, playing opposite stars like Elliott, Sunset Carson, and Allan Lane in films like Cheyenne Wildcat, Firebrands of Arizona, and Vigilantes of Boomtown. Republic also utilized Peggy in two serials, the first being The Phantom Rider (Republic, 1945). Stewart played Doris Shannon, a teacher at an Indian Reservation school who aided Dr. Jim Sterling (Robert Kent) in his fight against a gang of outlaws using the Reservation (off-limits to the local law) as a base. To help his struggle and outmaneuver the outlaws’ secret ally, the Indians’ medicine man, Sterling assumed the guise of a legendary Indian hero/deity, the Phantom Rider. It was Doris who gave Sterling the inspiration for the masquerade, and she served as his confidant throughout. The Phantom Rider was a fast-paced serial with plenty of action and an unusually large cast of characters. Peggy’s screen time was rather limited in comparison to that of Kent, Lewis, and Hal Taliaferro (as a comic prospector), and she seldom ventured outside of her schoolroom. She gave plenty of energy to her role, though, whether she was instructing her pupils or swinging up onto the back of the hero’s galloping horse. Above: Robert Kent (far left), Hal Taliaferro, and Peggy Stewart help the injured Rex Lease out of a wagon in The Phantom Rider (Republic, 1945). 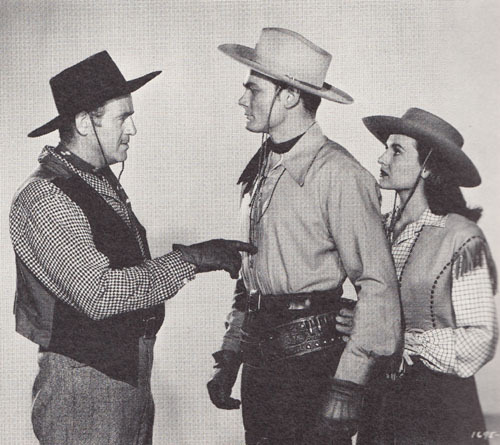 Above: Robert Kent (far right) and Peggy Stewart tangle with the villainous LeRoy Mason in a publicity still for The Phantom Rider. Stewart took a second break from her long string of Republic B-westerns in 1947 to co-star in the Republic serial Son of Zorro, definitely the best of her four cliffhangers. George Turner starred as Jeff Stewart, a lawyer and returning Civil War veteran who discovered his home county had been taken over by crooked politicians and their outlaw henchmen. Jeff donned the guise of Zorro (the original Zorro being an ancestor of his) to fight the villains, assisted by spunky postmistress Kate Wells (Peggy). Son of Zorro was one of the last Republic serials built around original footage and one of their best post-World War 2 cliffhangers, with inventive action scenes and a strong cast. It was also Peggy Stewart’s best chapterplay showcase; she had almost as much screen time as George Turner and was frequently allowed to display her riding skills. She also displayed her talent for being both charming (when interacting with Turner) and fiery (when defying the villains or answering their queries about Zorro’s identity with scornful sarcasm). Above: Al Ferguson accosts Peggy Stewart in this lobby card for Son of Zorro (Republic, 1947). 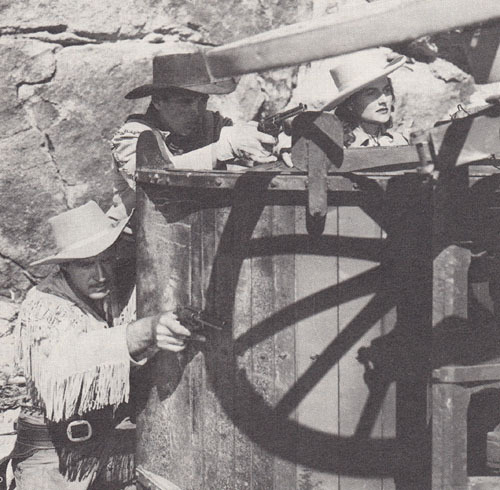 Above: Roy Barcroft, George Turner, and Peggy Stewart in a Son of Zorro publicity still. Tired of working exclusively in Westerns, Stewart left Republic when her contract expired in 1947. However, after her Republic stint, the casting directors at other studios also viewed her solely as a sagebrush heroine; one of her first non-Republic assignments was the cowboy serial Tex Granger (Columbia, 1948). She was cast as Helen Kent, an outspoken inhabitant of the outlaw-ridden town of Three Buttes who continually tried to spur laid-back newspaper editor Tex Granger (Robert Kellard) to action against banditry. Unbeknownst to Helen, Tex was secretly working to clean up the town as the Mystery Rider, the outlaws’ most powerful antagonist. Tex Granger was a somewhat dull and convoluted serial, but Stewart’s performance–particularly her humorously exasperated exchanges with the seemingly apathetic Kellard–was one of the serial’s more enjoyable elements. Above, from left to right: Slim Whitaker, Peggy Stewart, Britt Wood, and Robert Kellard in Tex Granger (Columbia, 1948). Above: Robert Kellard and Peggy Stewart have a verbal clash in Tex Granger. Peggy co-starred with Lash LaRue, Charles Starrett, and Jim Bannonn in B-westerns for Western Adventure, Columbia, and Eagle-Lion before appearing in her final serial, Cody of the Pony Express (Columbia, 1949). She played Linda Graham, the daughter of a Pony Express station owner, and helped a young Bill Cody (Dickie Moore) and undercover Army agent Jim Archer (Jock Mahoney) fight an outlaw gang secretly led by lawyer Mort Black (George J. Lewis). Like Tex Granger, Cody was a somewhat slow-paced affair partially redeemed by its cast; Peggy’s role was much smaller than her part in Granger, but she was likably feisty, friendly, and cheerful in each of her scenes, particularly when good-naturedly interacting with her grumbling, hen-pecked father (William Fawcett). Above: Jock Mahoney (kneeling), Dickie Moore, and Peggy Stewart in Cody of the Pony Express (Columbia, 1949). Beginning in 1950, Stewart largely abandoned feature-film work and began to appear frequently on television. TV producers continued to typecast her, and she guest-starred on The Adventures of Wild Bill Hickok, The Cisco Kid, The Life and Legend of Wyatt Earp, and other Western shows. She began a second career as a television casting director in the mid-1950s, but didn’t abandon acting, appearing on shows like Gunsmoke, The Fugitive, and Ironside throughout the 1960s and into the 1970s. In fact, she never has never entirely left the screen; she continued to make TV guest appearances in the 1980s and 1990s and has appeared on shows like The Office as recently as 2010. Now a great-grandmother, Peggy Stewart currently enjoys a happy semi-retirement in California and keeps in touch with the fans who recall her days as a leading lady. Peggy Stewart will always be principally remembered as the queen of B-western heroines, considering all the Western features she brightened throughout the 1940s, but her contributions to the serial genre, though limited, were also noteworthy. She could make middling serials (Tex Granger) seem more interesting and good serials (Son of Zorro) seem even better, thanks to her energy, grace, beauty, and all-around cowgirl charm. Above: A Republic Pictures publicity portrait of Peggy Stewart from the 1940s. Acknowledgements: Peggy Stewart’s “The Republic Years,” a collection of reminiscences edited by C. M. Parkhurst and published Chapter 27 of Those Enduring Matinee Idols, provided me with the biographical information in this article.